Good Tuesday Morning! Did you all have a wonderful 4th of July weekend? We sure did! Now that the holiday is over I have a challenge for you for the next 21 Days. The remainder of this month I am really striving to be as healthy as possible. I am over 7 months pregnant now and only have a few more months left of being pregnant. My weight is creeping up there and the one reason why: FOOD. Even though I am eating pretty well, I am still indulging way more than I used to before getting pregnant. When I was in the height of losing all my weight. But since becoming pregnant, I have enjoyed too many sweets and treats. Yeah, I have kept it under control, but now this month, I am going to really keep it under control. No more stashes of peanut M&M's to snack on, no more chips that I don't need. More watching how many yellow containers I am really eating. And indulging in healthy fruit as my go to sweetness for the day. 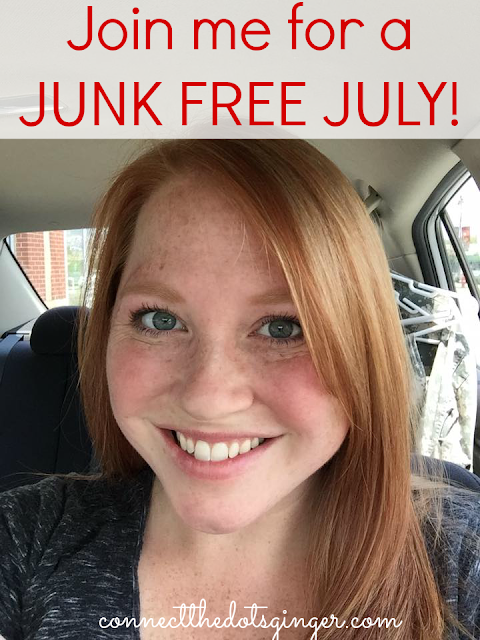 I AM GOING TO BE JUNK FREE IN JULY! STARTING TODAY! WANNA JOIN ME? Make sure you "like" my special Facebook Page: Becky Allen - Connect The Dots Ginger. I will be posting tips and info to help you stay junk free! And be sure to keep checking here for more tips too! Are you ready? I WANT YOU AND I AM READY TO HELP YOU! MESSAGE ME OR COMMENT BELOW TO LET ME KNOW YOU ARE READY! It's never too late to start and the first step to change is letting me know you are ready! EMAIL ME HERE! Or comment below!